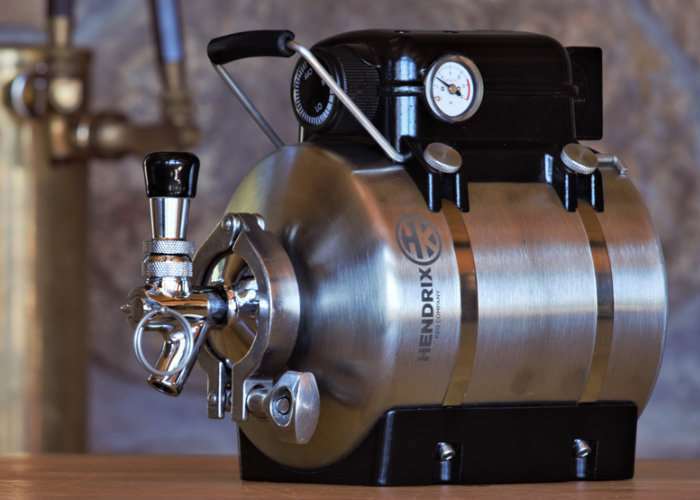 If you enjoy a craft beer you may be interested in a new premium worktop craft beer keg, called the Hendrix Keg, which has this week launched via Kickstarter to raise the $100,000 it requires to go into production. The premium craft beer keg has been designed to work like a growler but keeps your craft beer fresh using an adjustable CO2 regulator. Watch the demonstration video below to learn more about the Hendrix Keg. The craft beer industry is growing and the beer variety has never been better. However most of that brew is only available to take with you in a growler. But once you hand over your hard earned cash to purchase that growler it becomes a race against the clock. Soon that amazing brew will lose flavor and carbonation. We set out to solve that problem and the result is the Hendrix Keg. It’s designed to use like a growler and operate like a keg. Throughout the prototyping process we demanded the Hendrix Keg’s quality and craftsmanship match that of professional brewing equipment and it does. This is true American engineering. We have spent a lot of time and effort making this keg: designing, prototyping, testing, engineering, and purchasing production molding. The Hendrix Kegs you see here have been built with the same parts and molds we will use in our production run, so it’s ready for production and we are ready to put it into your hands. Once our campaign has been successfully funded we will be able to order the parts in large quantities, assemble the kegs, and ship them to craft beer lovers everywhere. We have launched this Kickstarter campaign to meet the people who share our passion for beer and start making kegs for them. So check out our rewards, support the project, and tell your friends about the Hendrix Keg! The Hendrix Keg is now available to back via Kickstarter with early bird pledges starting from just $100 and delivery expected to take place during April 2018. For full specifications and more information jump over to the official Kickstarter campaign page via the link below.